SOVREN is the vintage racing association in our region, the Society Of Vintage Racing ENthusiasts. The final event of the SOVREN racing season is the Maryhill Hill Climb. Hill climbs have fallen out of fashion as road racing events, except for the famous Pike's Peak Hill Climb, although they were popular in the 1950s when club racing was just getting underway. If you're having a vision of motorcycles or dune buggies driving up a cliff trying not to flip over backwards, a vintage hill climb is nothing like that. It's just a race for the quickest time up a mountain road. There's a possibility of cars going down cliffs, but not up. SOVREN revived this event a few years back, and they've got a great road to do it on, frought with Northwest history. One of the Northwest's early business tycoons was a man named Sam Hill, who apparently adored his wife Mary enough to name the town he built after her. This is not unusual up here -- there's better-known town further north named Anacortes, after someone or other's wife's maiden name, Ana Cortes. But that has nothing to do with our story. Sam was not only a successful entrepreneur, but also somewhat of a visionary. The road in question connected the road at the bottom of the hill it winds around and up (not called Maryhill, that's the town) to whatever was at the top of the hill (if I'd been paying proper attention, I'd know what) and, the time then being the turn of the 20th century, was used by horses and wagons. Sam paved it. This was the first paved road in Washington State. Over the course of many years, the road fell into disrepair, being no longer really good for anything except hill climbs. There were better ways to get from the road at the bottom, now State Route 14, to points north, and when parts of the road washed down the cliffs one particularly soggy winter, it was simply closed off and left to crumble. It's only recently been rebuilt and repaved. Now, that's interesting. Why restore a road that isn't needed and doesn't go anywhere? Maryhill is out a long way from nothing much, although it's something of a tourist spot due to Sam's other accomplishments, which I'll get to in due time. Did local shame that the first paved road in the entire state had fallen off the mountain -- a road paved by a man whose very own wife gave her name to their town -- cause the townspeople themselves to rebuild it? Did the State Historical Commission finally run out of Lewis's and/or Clark's footprints to preserve and realize they'd better find something else to fix up quick or they'd all be out of a job? It's a mystery. Anyway, there's the road -- two miles of perfect asphalt winding up a big hill and connecting to nothing at the top except a small parking lot. It's not open to vehicular traffic and is used mostly by suicidal skateboarders (going down), masochistic bicyclists (going up) and hikers with allergies to walking on dirt (going both ways). I don't quite grasp its appeal for family outings: "Hey, kids! Let's walk up two miles of asphalt today and have a picnic in a parking lot! Won't that be fun!" But there's no denying the fact of it -- there's the road. As historic racing associations go, SOVREN is more concerned with the historic part than most. They have strict rules that the cars really have to be fitted out with only the stuff that was available and legal to use in the year the car was built. I'm not unsympathetic to this notion, but it puts Volvos at a disadvantage because Volvo never homologated the go-fast stuff that actually was available back then. 1800s up here have to run with B18s and SU carbs, and you can only overbore the B18 .040" one time as part of a rebuild. Cars have to have full interiors and windows that roll up and down. Little Alfas and Cortinas stomp us every time, so there aren't many Volvo racers in SOVREN. Be that as it may, there used to be hill climbs on this particular road before it crumbled, and so SOVREN has seized on the historic nature of this to start the tradition all over again. It's the only day of the year when the road is open to motor vehicles, and that's limited to the racers and two school buses that drive spectators to viewing areas between runs. Never having been to a hill climb, and being desparate for an excuse to get out of the house and away from any sort of computer for at least part of a day, I had to check it out. Not really knowing quite where the climb takes place, I did a search on the Web. There are towns called Maryhill all over the U.S., so either Sam got around a lot more than I think he did or they're named for someone else. The keywords "hill" and "climb" will get you 40,000 websites that have nothing to do with this event. I finally found the right information on the Maryhill Museum site, oddly enough. Sam was patron of fine art and founded this museum way out in the sticks to house his Rodin collection, along with much else. The museum has a well-developed website that also seems to serve as a catch-all for whatever else is happening around Maryville, including road racing. I got the date and time for the event and a map to the museum. SR-14 runs along the Columbia River on the Washington side, paralleling I-84 on the Oregon side. The river runs through a huge cut in the Cascades known as the Columbia Gorge. I-84 is much like Interstate anywhere, but SR-14 is a much more scenic drive that still gets you places fairly quickly. We'd taken runs in the 1800 as far as a landmark called Beacon Rock, which takes about an hour to get to. I was under the impression that Maryhill was perhaps ten miles beyond that. It's not. Marsha and I had a very enjoyable drive, although twice as long as we'd expected. The road is both fun and fast, for the most part, and takes you through picturesque little towns. The only industry around when those towns were built was logging, so they have names like "Mill A." The logging has mostly been replaced by poverty, but the towns are still there, hanging on to the cut in the mountains by the river's edge. After two hours and eight or nine towns, we came out the other side of the gorge. It's really sudden -- one minute you're zipping along through forest and greenery, then you go around a turn and you're in arid grassland. At the start of autumn, everything is golden and dusty and suddenly hot. I imagine it pretty much stays that way from the exit of the gorge to the Great Lakes (except for the Rockies, I suppose) and it's part of the state's character I'd never seen before. Washington styles itself "America's Switzerland," but it seems most of it is a lot more like South Dakota than the Tyrol. Of course I knew this, but I hadn't expected to see it for the first time that day. After a little while more, we saw a sign for the Maryhill Museum and followed it. I was under another mistaken impression that the staging area for the hill climb was right by the museum. I wasn't alone in this, for there were several other sporty-looking cars circling the parking lot looking for clues. Not finding any, we went back to the main road and continued on. Half a mile later, there actually was a temporary sign for the event, and then another one a ways down that road, and then we were there. How people who want to go asphalt hiking and parking lot picnicking find the place the rest of the year, I have no idea. "There" turned out to be a cow pasture, just recently emptied of cows. A paved road gives ready access to the pits, but spectators have to drive across the pasture for a good ways. It's a lumpy pasture. We crawled along in first gear along with BMWs, Porsches and a vintage Ferrari. I don't recall ever seeing six-figure machinery dodging fresh cow pies before. They weren't any better at it than we were, just more worried about it. Having arrived a lot later than planned, it was now time for the lunch we'd packed. Marsha's not much for heat and dust and not a speck of shade in sight, so she ate her sandwich sitting in the car. I took mine for a stroll over to the starting line, along with a pickle that seemed determined to leak juice all over my shirt whenever I bit it. Best to eat it right away before it dehydrated. 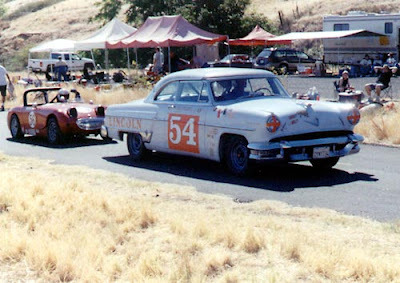 There was quite an assortment of race cars -- everything from open-wheel formula cars to a lovely old Allard to a mid-'50s Lincoln Capri that was once used to run La Carrera Panamericana, and everything in between except for Volvos. The next run was just starting. Cars lined up nose-to-tail were launched at one-minute intervals for solo runs up the hill. The official doing the launching used a flamboyant technique, holding a checkered flag in front of each car's windshield while counting down the seconds remaining on an electric bullhorn. When he got to zero, he'd yank the flag out of the way, the car would take off and disappear around the first turn a hundred feet up the road. The line would then immediately move up one car length and the process would start over. I didn't understand the launch technique attempted by drivers of the many old small-bore Alfas. The method was to rev up like a giant angry mosquito as the count neared twenty or so, then dump the clutch as the flag disappeared from the line of sight. Not having enough torque on hand to actually spin the tires, the car would leap forward about a foot until the flywheel quit and then just about stall. The driver would push the clutch in, persuade the motor to keep running, and make a second, much quieter departure. I can understand one or two Alfa drivers trying this once or twice, but they all did it every time. Maybe that's how Nuvolari used to do it, or something. The best take-off of the day was by a '62 Corvette that showed no evidence of being a race car except for sporting a rollbar. Most drivers would be in their cars at least five minutes before their runs, eager to move up a spot in line (as if that would get them to the top any sooner). Not the Corvette driver. There were four empty slots ahead of him before he even approached the car and casually began putting on his racing suit. By the time he got into his seat, his minute was already ticking away. "Does that thing run or not?" shouted the official through his electric bullhorn. "Hey, I heard that!" yelled the unruffled driver back, casually pulling on his helmet and adjusting its strap for a while. At 30 seconds, he put on his sunglasses and fiddled around with them. At 20 seconds, he started the motor and began idling up to the start line as slowly as possible while getting himself strapped in. At 10 seconds, he began pulling on his gloves. At five seconds, he was fastening the snap on his first glove. At two-and-a-half seconds, he was snapping the second glove. And at zero seconds, he was away in a cloud of tire smoke, never having revved the motor once. Those Route 66 actors could take lessons in cool from this guy. We took the bus ride to the top before the next run. That hundred feet before the first turn is the only real straight in the two miles, the turns are mostly hairpin and the road is so narrow that the downhill bus has to wait at a wide spot for the uphill bus to go by. It's a tough two miles for the drivers. You can see most of the second mile of road from the top, and cars come into view as little bitty things way down below. Another official was doing his best to announce the race through another electric bullhorn, trying to identify the cars as they came into sight, look up the drivers' names and think of something interesting to tell the small crowd of spectators about whatever car was coming up next. I took pity on him and helped with the spotting and looking up for a while. There was no more shade at the top than at the bottom, there was no less heat and there was, if anything, more dust. Marsha and I bailed out, took the bus back down, drank most of a bottle of water we had in the cooler, crawled our long way out of the cow pasture in first gear and headed for the highway. We wanted to see one more of Sam Hill's claims to fame before turning for home. Sam was not only a millionaire, a town namer, a road paver and a museum bulder, he was also a member of the Society of Friends (commonly known as Quakers) and a devout one at that. The death toll of young Washingtonians in World War One horrified him, so he built a war memorial. 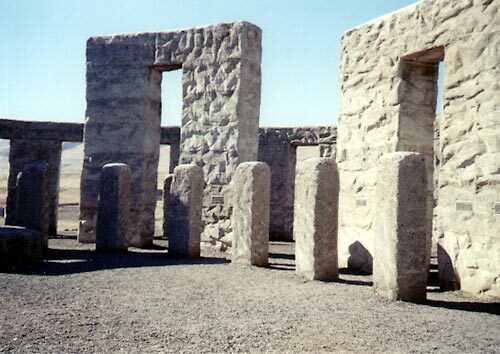 I suppose it wouldn't do for a by-definition pacifist to put up some sort of heroic military statue, and a fountain or flower garden lacked sufficient drama, so Sam built a full-scale replica of Stonehenge out of concrete. There it is, all by itself out in the middle of nothing, looking entirely out of place in the desert-like fall climate. But just like the road and the museum, there's no denying the thing -- there's Stonehenge. I gave all the 1800's windows a good cleaning to get the dust off before hitting the homebound highway. The sun would be setting in front of us before long. Who Says Old Cars Aren't Fast? Check out this 1964 Holman-Moody prepped Ford Fairlane take on the Nurburgring. This car is very reminiscent of cars that run La Carrera Panamericana. The 5th Annual Chihuahua Express! What? Unlimited open-road racing on paved highways across northern Mexico. When? April 8-9-10, 2011. Three days of racing with no limit on your speed. Why? Where else in the world can you race at top speed for three days on public highway and have lunch at one of the greatest tourist attractions in the world? Location? Chihuahua City is only 145 miles west of Presidio, Texas. Race Headquarters: Soberano Hotel, Chihuahua City. Cost: $2000 entry free until November 1. Then it goes to $2200. Hotel accommodations are additional. Rooms at the luxury Soberano Hotel are $165 per night, tax included. Less expensive hotels are nearby. The TSD “regularity” rally, bracket, and Express Tour classes are $1200, plus hotels. Training in stage rally timing is provided. Sponsors: Telmex, Corona, PFP (Mexican Highway Patrol), State of Chihuahua, Red Bull, SportCar.com, BMW, Quaker State, and FedEx. Eligible Cars: for unlimited competition, any car from any era, is eligible, if equipped with an acceptable six-point roll cage and safety equipment, such as five/six point seat belts and HANS devices. Cars without roll cages may participate in the TSD rally, “bracket” competition, and the Tour. Detailed information about roll cages and other safety requirements is available. Classes: the eight classes of modern cars eligible for unlimited competition are: normally aspirated engines (1) up to 1.6 liters, (2) above 1.6 to 2.4 liters, (3) above 2.4 to 6.2 liters, (4) above 6.2 liters, (5) Specials, and (6) Unlimited. There will be two turbo classes: (7) stock turbo-charged cars up to 2.4 liter, (8) stock turbo-charged over 2.4 liter. In addition, there can be up to nine Pan Am classes, plus Mexican rally classes. The regularity rally and Tour cars are not classified by engine size. Brake pads, shocks, springs, and certain other parts may be upgraded on “stock” cars. After technical inspection, any car may be assigned to a different class based on its modifications -- to promote fair competition. Carrera Panamericana cars are automatically eligible and will be assigned to their appropriate class, such as Turismo Mayor/Production or Historic A+/A/B/C. Three similar cars are needed to constitute a class. If there are not enough cars to constitute a class, the remaining cars will be assigned to the next fastest class. Cars without roll cages may participate in the TSD rally, “bracket” competition (min. and max. speed in the speed stages) or the Tour. Tour cars drive the same route as the competition cars, obeying the speed limit, with no passing allowed. Car Crews: A navigator is required in all cars, in all classes, and there can be no more than two people in any car during competition. Drivers should have sufficient training or racing/rally experience before attempting unlimited competition. Prizes: Daily awards by class for driver and co-driver and overall trophies at the final awards ceremony. There are no cash prizes. Event Schedule: The cars will be inspected on April 6-7 at the Soberano Hotel. On Friday, April 8 the competitors will race northwest to Ciudad Madera, and then race back to Chihuahua. On Saturday, April 9 they will run southwest into the famous Copper Canyon area and return. On Sunday, April 10, they will head east to Ojinaga (Presidio, Texas), and return. Each night there will be a driver’s meeting and awards ceremony. Format: In a stage rally like the Express, the competitors follow detailed directions in a route book. At appointed times, they will line up eight or more times a day to drive speed stages. The cars are started in one-minute intervals over highways in the hills and mountains closed to traffic by the Mexican Highway Patrol. The fastest cars go first, but passing is allowed. The length of the closed road or speed stage will normally be five to fifteen miles. Electronic timing is used. Road surfaces in northern Mexico are generally excellent. Some cars will reach speeds approaching 200 MPH. After each speed stage, the competitors will drive a short “transit section” to the next speed stage. The cars must check in at the next speed stage within 59 seconds of their assigned time. If they are early or more than 59 seconds late, they accrue a minor time penalty. Penalties are rare in the Express because of the short transit stages. The cars with the lowest total elapsed time (E.T.) for the speed stages, plus any time penalties, will be declared the winner by class and overall each day and for the entire event. The event includes nearly 325 miles of speed stages in a total of about 1,000 miles. Rules: This event will use the same basic rules as the Carrera Panamericana, which are posted on the official web site www.chihuahuaexpress.com. Rationale: The Express was designed to be: a weekend event; close to the USA; feasible without a support crew; run on good open roads in sparsely populated areas; scenic; relatively inexpensive, and based in same hotel each night. The weather should be sunny and pleasant, and rain is usually not a factor. The roads are excellent in this part of Mexico. Support: Tow trucks may travel to Chihuahua City or be left across the border in Texas or New Mexico. The “Express Convoy” will leave El Paso on April 6 for the short trip to Chihuahua City. Mechanical support may be arranged locally. Tourist Permits: Mexican tourist permit for vehicles cost $35 at the border. Permits may be purchased at some Mexican consulates and via the Internet at http://www.banjercito.com.mx/. Cars and tow vehicles must have a permit to travel more than 30 KM into the interior of Mexico. Competitors also need a tourist visa (FM-T), which can be obtained at the border or a consulate. Police Services: Officers of the Mexican Highway Patrol accompany the event and work with 300 local police on clearing the roads and providing security. Rescue and medical crews, along with the timing and scoring staff, travel with the race. Auspices: The Federation of Mexican Auto Sports (FMAD), an affiliate of FIA, sanctions this event. All individuals riding in a car, in all classes, must hold a FMAD rally license for calendar 2011 to participate ($260+ USD). The license provides personal medical, death, and dismemberment insurance. Increased coverage is available. The event Organizer provides general liability, racing insurance coverage. The FMAD license is also be valid for the Carrera Panamericana in October. Auto Insurance: All cars and trucks operated on public roads in Mexico, including the racecars for this event, should be covered by auto liability insurance issued in Mexico. U.S. auto insurance policies do not cover you south of the border. You may purchase Mexican insurance by the day or week at http://www.bajabound.com/?r=panamrace . This insurance covers a racecar only when it is not in competition. Include $165 for each night of accommodations at the Soberano Hotel. The rooms fill up quickly. Most competitors will stay five nights (April 6-10), checking out on April 11. Other hotels in the area are the Holiday Inn Express, Hampton Inn, and City Express. A schedule for refunds, full and partial, will be provided. Warning: Auto racing in any form is dangerous and may lead to property damage, and serious injury or death. Competitors assume all risk to their safety and property, and hold the Organizers and their agents harmless. The Chihuahua Express is a great way to test your car for Carrera Panamericana and learn how to drive and navigate in a Mexican stage rally. Set your own speed. **PAN AM FOR 2010 OVERBOOKED? 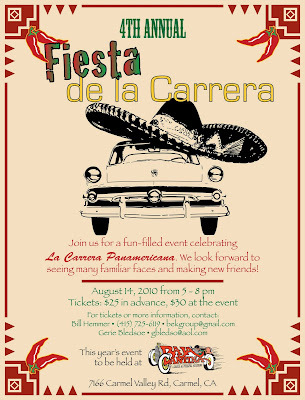 **CARRERA FIESTA IN MONTEREY – A SMASHING SUCCESS! **NEED HELP NAVIGATING IN MEXICO? Eduardo Leon, the Honorary President of La Carrera Panamericana, announced that the event has 118 paid entries and 27 competitors “on the waiting list.” Normally, the race is limited to 100 competitors because of the time limit on closing the roads for rallies in Mexico. Entries from North America were cut off, in effect, at 33 this year, despite an earlier allocation of 40. Thus a few norteamericanos, including some veterans, were precluded from signing up. The new entries are mostly from Europe, primarily Western Europe, Sweden, and Finland. By far, the largest class will be Historic C, which comprises American sedans (Mustangs and Falcons mostly) with V8 engines. Historic A+ (four cylinder cars, 1965-1972) is also growing rapidly. The organizers apparently expect attrition over the first day or two to reduce the number of competitors significantly. Normally 1/3 of the serious mechanical failures (blown engines and transmissions) and accidents occur the first day when testosterone levels are amped up. 1. The Pan Am race will NOT venture into Mexico City this year, but will go around the city on the new by-pass, the Arco Norte. Apparently, traffic in the nation's capital of 22 million souls is worst than ever because of long-term construction on the main freeway into and out of town. 2. Reportedly, the Carrera cars will run speed stages to the east of Mexico City, perhaps in the Pachuca area, before going on to Queretaro. 3. The event will also return to the beautiful but potentially lethal mountain road called “Mil Cumbres, which means a thousand peaks, outside of Morelia. One report, cited on the Carrera's official web site, said the road was in the best condition ever. Others report it has been re-surfaced recently. From of the top of the mountain to the bottom there are approximately 330 corners, with many hairpins lined with boulders, big trees, and ravines. Around each corner can lurk some dangerous obstacle—from slippery pine needles to wrecked cars, from felled trees to water hazards. 4. 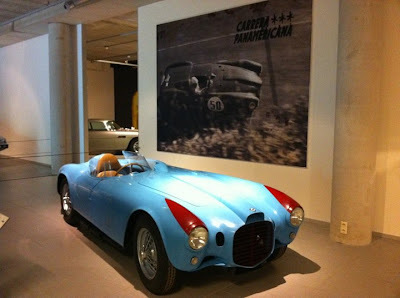 Reportedly, Carrera 2010 will NOT visit the town of Tequila in Jalisco, like it did last year. Instead, the race will end that day's run in a shopping center in Guadalajara. 5. As announced in CARRERA NEWS, the Pan Am will terminate this year in Zacatecas, not Nuevo Laredo. The final awards ceremony will probably be held in the Quinta Real Hotel, the famous "bullring hotel." We assume, of course, that the racecars will run one or two speed stages on the road called “La Bufa,” which is on the mountain by the same name high above the city, before they finish in the main square by the cathedral. Spectators should not miss the end of the race and the ceremonies in Zacatecas, a spectacular city by any measure. Troubles among drug gangs along the Mexican border and the Federal government makes most tourists reluctant to drive into Mexico. That's a pity, because Mexico is a lovely country, and peaceful for the most part. The solution is the Coyote Convoy. The convoy, made up of 20 or so tow trucks, trailers, and colorful racecars will cross the border and travel the 540 miles into the peaceful interior of Mexico together. Anyone is invited to ride along with the convoy. There’s no charge. This is the ninth year of the convoy and we haven't lost a soul (or car) yet. Oct. 15, 8:00 PM. Meeting at Residence Inn del Mar, Laredo, Texas to discuss the route. Afterwards a shuttle will take anyone to the border who needs a visa or temporary vehicle importation permit. Oct. 16, 6:00 AM. Line up in front of the hotel and head for the border. 6:00 PM. Arrive in San Miguel de Allende -- just picked by Travel and Leisure Magazine as the fourth top city to visit IN THE WORLD! It’s 540 miles away. Oct. 18, 7:00 AM. Depart for Tuxtla Gutiérrez, going around Mexico City. 10 PM. Arrive Tuxtla Gutiérrez (pending weather and travel reports). The race starts on Friday, October 22 and ends on Thursday, October 28. A qualification run is schedule for the afternoon of October 21. Spectators are invited to watch the preparation of the cars at the fairgrounds (La Fería) in Tuxtla Gutiérrez (Chiapas), October 19-21. More than 60 Carreraistas attended the Fourth Annual La Carrera Fiesta in Monterey, California in conjunction with the Monterey historic races on August 14. 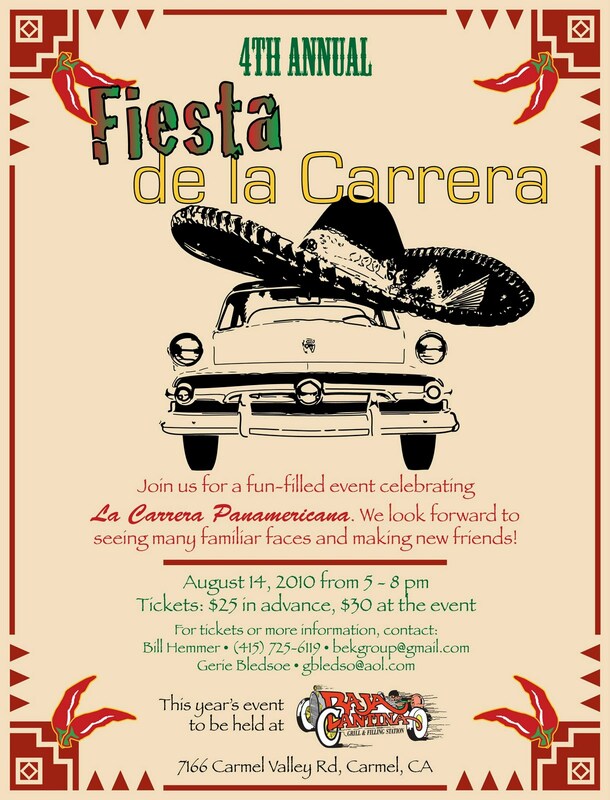 This year the fiesta was held at the Baja Cantina and Café on Carmel Valley Road, next to The Quail Lodge. Our wonderful host again was Bill Hemmer, a local contractor and Porsche guy, who has been a competitor twice in LCP. The highlight of the evening, in addition to the six or seven Carrera cars on display, was the screening of 52 minutes of 16 mm color film from the original Pan Am race in 1951. It was the first segment of a film collection, recently discovered, that totals 17 hours on the races in 1951-1954. The film was taken by the crew of Ray Crawford, a war hero and super market chain owner in L.A., who finally won the event in 1954 in a Lincoln. The film was discovered by Crawford’s family in cardboard boxes in a garage in L.A. in excellent condition. The Kellogg Auto Archives in Los Angeles has been restoring the film and kindly allowed the first segment (in DVD format) to be shown at the fiesta. The owner of the archives, Ron Kellogg, is looking for investors and producers who would like to see the film prepared and edited for TV. This film may be the most important single collection of early Carrera film extant. Visit the archives web site at www.kelloggautoarchives.com. Something must be done to make this important film available to the racing community. 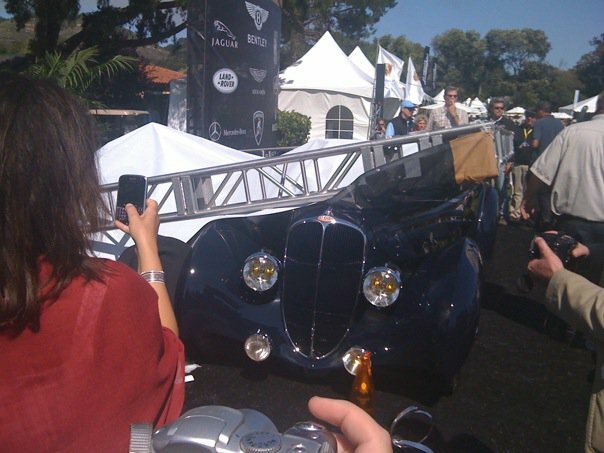 There is an unconfirmed report that Pan Am cars this year will have a German GPS transmitter installed. Last year was the first in several that the cars did not carry GlobalStar transmitters. The problem with these systems is: someone must monitor a web site while the cars are in competition and have a phone number to call in the case of an emergency. Unfortunately, the web site cannot distinguish between a crash and a flat tire. Some competitors are considering using a “Spot-2” GPS device, which allows a car to be tracked via computer or cell phone. It costs $149.00, plus a $99 annual subscription. This device allows the car’s crew ro send a SOS message to two cell phones. Cells phones now work along most of the race route, but there are still places that require a Iridium satellite phone to ensure immediate communications. Most cars and service trucks will also find it important to carry a Garmin GPS unit loaded with the latest maps of Mexican roads and cities. Buy your Garmin from any store and then contact Mark Walker at mwalker@mexicomaps.com in Santa Barbara, CA for the 2011 Mexican map software ($104.00). I’ve used this software for three years now and have seen vast improvements. The software is most useful when trying to find the starting and finishing arch, plus the nightly driver’s meetings, in the cities along the route. The Garmin will also help in the transit sections. Mark also sells the best book of maps of Mexico, the Guia Roji, which is supposed to be out in a new edition soon. The old edition does not even show the Arco Norte being complete around Mexico City. You can also call Mark at 805-687-1011. The Organizing Committee for the Pan Am, which is essentially the family of Eduardo Leon, has moved aggressively recently to protect the event’s trademark. The attorney representing the Committee, Luís Baron, has sent “cease and desist” letters to individuals in Germany and the United States demanding that they stop using the official trade mark “La Carrera Panamericana” on web sites. Competitors and others should understand that this trademark is registered and thus protected by international treaty. A violation would normally mean someone is engaging in a business where money is being made using the trademark. Of course, it would be an exceptional race team that actually made any money from competing in the Pan Am, since there are no cash prizes or other financial incentives. Regardless, if your team plans to use the official logo, you should ask for permission from the Organizing Committee. Contact monica.grossmann@yahoo.com.mx. CREW MEMBERS NEEDED. Some teams need mechanics and tow truck drivers. If you or a friend would like to be a volunteer for a team, please let me know immediately. gbledso@aol.com Normally, the team only provides a hotel room, occasional meals, limited visits to the “hoochimamas,” and unlimited fun in the hotel parking lot at midnight prepping the racecar for the next day’s competition. DRIVING SUITS FOR SALE. Tired off driving suits that make you look like the Pillsbury Dough Boy? Tired of suits that don’t show off your girlish figure, bodacious tatas, and great legs? There is a solution--have a suit tailored for your supple body at a very reasonable price in the USA. Imagine that, something stitched in the USA! PAM AM TOUR – do you or a friend want to watch the Pan Am this year? The best bet is to take the Tour operated by Rosa Maria Mondragon. She may be full already but you can email her at racecarmedia@yahoo.com.mx. 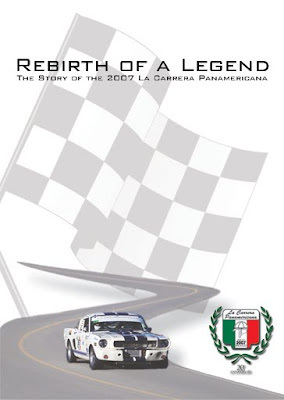 East Coast Carreraistas are gathering on September 1 to watch the director's cut of the GT Racer segment on the Carrera 2009. For more information, go to http://www.gpny.com/node/663. You must buy Mexico auto insurance to drive into Mexico. Canadian and U.S. insurance is no good below the border. The race organizers will require proof of liability insurance on all tow trucks (servicio) at registration in Tuxtla. The organizers provide third-party liability insurance on the racecars while racing, but you might want the racecar covered at other times as well. To buy insurance on line, especially on older cars, go to “Baja Bound,” an insurance broker in San Diego. Their web site will offer you a variety of insurance companies and optional coverages, and you can pay by credit card. They understand La Carrera. If you do not have insurance and have a wreck in Mexico, you may be “detained” by authorities until the wreck is investigated and damages determined. This is especially true if anyone is hurt or killed, or there is extensive physical damage. Please note that La Carrera Panamericana is a long, difficult endurance rally. Like all motor sports events, it is dangerous and can result in serious injury and even death. Prepare your car well and drive it carefully, especially the first two days of the event. There will be one issue of CARRERA NEWS—the infamous handicapper’s edition-- before the event, in addition to CARRERA DRIVER and any necessary SPECIAL BULLETINS. Those interested in the Coyote Convoy should be on that mailing list, too. I have just watched the dvd of The Rebirth of a Legend. Its so great, you have a fabulous video document. I enjoyed a lot the history of how the car was picked and built, the preparation involved in creating the team and how the race started to come a long and how is lived from within, with all the mishaps and learning from the team and the race. And how is enjoyed by everyone involved in it and even being a rookie wasnt a thing to stop from being a competitive team and achieving a great overall position and 3rd in class. Some of the features I enjoyed the most are the great editing and sound and how the actual scenes were mixed with part of the history of the race and the comments from persons involved from both eras. 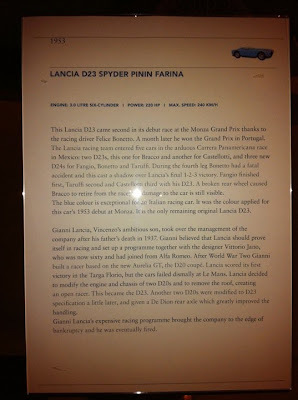 I also liked the part of the autodromo, with the pace notes below. It really makes you feel you are there! I have been a fan of the Carrera since I was a child and this dvd has taken up many notches my liking for the Carrera. Just watching it has making me want to build a car and race in it. Hopefully I can do it someday. I hope everyone that watches enjoys it as I did. And Im sure everytime I watch it again I will find many more things to enjoy. While our friends Colin Herrick and his wife are in Europe on holiday they managed to take in some very nice museums one of them being the Louwman in the Hauge. 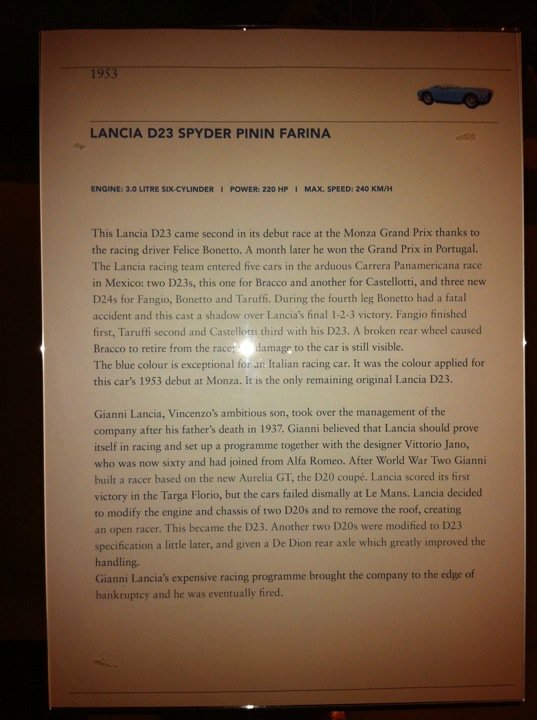 While there are many amazing cars there this Lancia D23 Spyder Pinin Farina really caught my eye especially since I have been doing some research on it even before Colin went there. 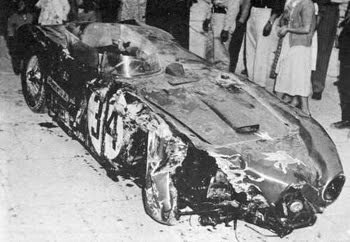 This is what was left of Bonetto's Lancia. Photo courtesy of Mike Emery. The gathering was the largest by far and was enjoyed by everyone. There were many who have competed in LCP as well as many that are planning on attending future races. There were some fine examples of LCP cars on display and don't forget the food. The fajitas were to die for! Like I said, our gracious host really out did themselves this year. If you haven't made this event in the past start by putting it on your calender for next year. Also on hand was Gerie Bledsoe and his wife just back from San Miguel de Allende to speak about the up coming LCP and take some questions. There was also some never before see 16mm movie shown. Don't Forget It's Monterey Historics & LCP Get Together Time! If you've never attended this function I'm here to tell you it's a MUST do and this year it's even better for several reasons. One being that it's being held in the evening rather than during the races which makes it much easier so as not to be rushed or miss anything. What a great way it's going to be to cap off one of the most exciting automotive days of the year. Your gracious Host Bill Hemmer and Carson Scheller need to give the Baja Cantina a final count of how many to expect so please RSVP. Bill can be reached via email at bekgroup@gmail.com or by phone at 415 725 6119. Also remember that David Hinton, the leader of Predator Racing and Pan Am vet, has invited everyone to come by their tent in the paddock at Laguna Seca on August 14-15. If you wear you Carrera hat, shirt, etc., he will treat you to a cool drink. Dave's red E-type Carrera car will also be on display. See Ya In The Movies! CLICK HERE for a visit to the World Premiere of Lorelei and Rebirth of a Legend.